Try out a range of printmaking techniques including printing from textures, found materials and cut papers as well as traditional wooden type letterpress. The Double Elephant team will host free hands-on daily workshops during the festival. Suitable for all ages and abilities, this is a chance to get inky, to challenge yourself and challenge your neighbours. Come with ideas, words and images which explore the theme of rivalry and take away hand-printed artworks to display at home. 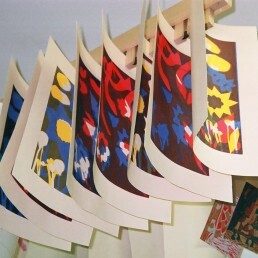 Double Elephant is a fine art printmaking studio based in Exeter, providing courses, resources and support. They are passionate about printmaking and its possibilities.